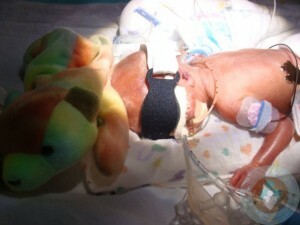 On September 25th 2008 at 24 weeks 3 days Cayden River came into this world weighing a mere 1lb 4.8oz. Mom Carol was diagnosed with HELLP syndrome, a life-threatening obstetric complication where the only treatment is to deliver the baby. At birth Cayden’s first few days were very difficult causing Doctor’s to place him on an oscillating (high frequency) ventilator. At 15 days old, he was transported to the Children’s Hospital in Boston after three rounds of medication were unsuccessful in closing his PDA (patent ductus arteriosus -a blood vessel that normally closes at birth remains open). It took a few days for Cayden to stabilize enough to have the surgery done, but once finished, he came through just fine with the surgery being a success. Not long after he developed a pneumothorax (collapsed lung) and needed to have a chest tube inserted. In order for staff to accurately monitor his CO2 levels he required blood work to be drawn about every 20 minutes, which caused him to need quite a few blood transfusions. When he was strong enough to be transferred back to his main hospital Cayden had yet another setback when he developed an infection that turned out to be pseudomonas (a bacteria) which caused pneumonia. Once he recovered, at just over a month old, Cayden was able to have breastmilk for the first time and was also finally able to be held by his mom. I spent several hours every day doing kangaroo care, sitting with him as long as I could. Determined to get bigger, Cayden still managed to hit the 2 pound mark even though an intestinal infection stopped his feeds for a couple weeks. This was his time to “feed and grow” and he did – hitting 3 lbs just 2 weeks later! When Cayden was just over 2 months old, his eye exams showed some deterioration and he was transferred to another hospital for laser eye surgery. After a successful surgery Cayden was transferred back and switched from a ventilator to CPAP (continous positive airway pressure). To his mom’s delight he was now strong enough to breast feed. Cayden spent a few more weeks growing and was released from the NICU after 132 days weighing 8 lbs 8 ounces. Like many babies born this early he did go home on oxygen (nasal cannula), but only needed it for three months. 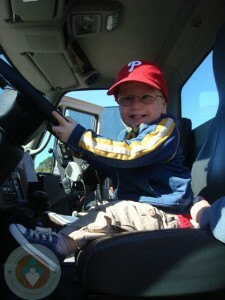 As for lasting effects from his prematurity, Cayden does have vision issues. He sees fairly well but has a lazy eye and strabismus (crossing), with limited peripheral vision from the laser eye surgery. He started wearing glasses at one year old, and patches one eye for two hours a day. Cayden is also delayed developmentally (not talking at two years old) but is catching up in most areas. He just turned two, so mom is still not sure of any other lasting effects. Join some support groups and talk to other parents at the hospital or online – you are not alone! !